Fluorescent proteins (FPs) offer scientists a simple yet powerful way to tag cellular proteins and investigate protein localization, interaction, and expression. However, one caveat of FP-protein fusions (FP-chimeras) is that they undergo normal protein turnover. FP-chimeras are continuously synthesized and degraded within the cell, so at any given time, an FP-chimeric protein may be at any one of many stages of synthesis and degradation. For this reason it is virtually impossible to determine specific protein turnover or temporal expression using standard FP-chimeric proteins. Photoactivatable fluorescent proteins (PA-FPs) are fluorescent proteins that display unique changes in their spectral properties upon exposure to a specific wavelength of light. PA-FPs can be activated from low fluorescent states to high fluorescence states, they can change from one fluorescent color to another, or their fluorescence can be switched on and off reversibly. This ability to modulate fluorescence allows scientists to observe single fluorescent molecules that would otherwise be missed with conventional FP imaging. PA-FPs are divided into 2 main categories - those with irreversible and reversible photoactivation - and have enabled sophisticated imaging techniques. Irreversible PA-FPs can be switched on from a state of dim or no fluorescence, to a brighter fluorescent state by exposure to a specific wavelength of light. The switch or photoconversion usually takes less than a second. The first successful irreversible PA-FP reported was PA-GFP. PA-GFP was derived from Jellyfish (Aequorea victoria) GFP (wtGFP) by mutating Threonine 203 to Histidine (T203H) (1). wtGFP normally contains a mixed population of neutral (protonated) and anionic (deprotonated) forms of the chromophore which contribute to the 2 peaks of wtGFP’s excitation spectrum- a major 397 nm peak and minor 475 nm peak, respectively. When wtGFP is illuminated with UV-violet light (~400 nm), the chromophore photoconverts predominantly to the anionic form, causing increased fluorescence when excited with 488nm blue light. The T203H mutation in PA-GFP generates a chromophore population that is more neutral, causing PA-GFP to display almost no fluorescence when illuminated with 488nm light. However, when UV-violet light is presented first, it causes irreversible photoconversion of the chromophore from the neutral to the anionic form, which allows PA-GFP to exhibit up to a 100-fold increase in fluorescence when illuminated with blue light (1). Similar to PA-GFP, scientists later developed red fluorescent PA-FPs by performing several rounds of random mutagenesis screening for enhanced RFP variants. PA-mCherry (E26V/A58T/K69N/L84F/N99K/S148L/I165V/Q167P/L169V/I203R) (2) and PA-mRFP1(S146H/I161V/I197H) (3) were derived from DsRed and mRFP, respectively. When illuminated with violet light, both variants are photoconverted to forms that emit brighter red fluorescence. Since emission of green light is more phototoxic to cells, most scientists working on in vivo imaging models perfer the PA-RFPs over PA-GFP. 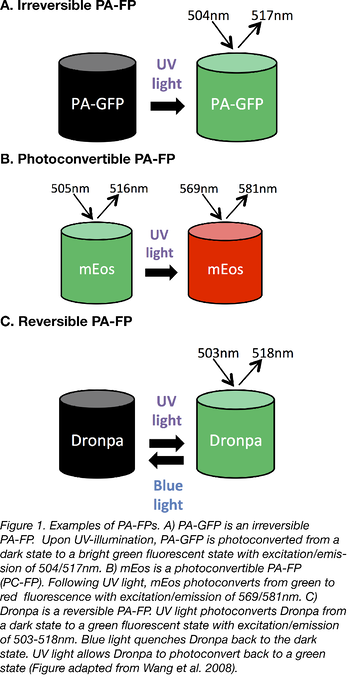 Another class of irreversible PA-FPs are the photoconvertible fluorescent proteins (PC-FPs). PC-FPs can convert from one fluorescent color to another (e.g. green to red, or cyan to green). For example, mEosFP (named after the goddess of dawn in Greek mythology) switches from green to red fluorescence. mEosFP exposure to UV light causes an irreversible cleavage near the chromophore, resulting in emission of red fluorescence (4). The dimeric or tandem dimer versions of EosFP are preferred over the monomeric one since the formation of mEosFP’s chromophore requires a temperature below 30 °C and this is not ideal for experiments in mammalian cells. Dendra2 is another monomeric PA-FP which unlike mEosFP, can form it’s chromophore at a more comfortable 37 °C (5). Dendra2 photoconverts from green to red fluorescence when exposed to blue light, which is less phototoxic to live tissue than the UV light used by other PA-FPs. Several other irreversible PA-FP spectral variants have been discovered such as Kaede and PS-CFP2 (see Table 1). In contrast to irreversible PA-FPs, reversible PA-FPs (also known as photoswitchers) can be photoswitched from a dark state to a bright fluorescent state (“kindling”), and from a bright state to a dark non-fluorescent state (“quenching”). The photoswitch can occur multiple times by activating with two distinct wavelengths of light (see Table 2). The best known reversible PA-FP is the naturally occurring Dronpa protein (named after dron, a ninja term for vanishing, and pa, for photoactivation) (6). Dronpa is photoactivated by blue wavelengths of light, causing emission of green fluorescence, but then further exposure to blue light also inactivates the chromophore, leading to a non-fluorescent state. Dronpa can be reversibly reactivated by exposure to UV light. The fact that blue light both activates and inactivates Dronpa is not ideal, since this means Dronpa is quickly inactivated and less photons are emitted leading to dimmer fluorescence. In fact, many of the early reversible PA-FPs also display this “negative” photoswitching. In 2008, scientists used mutagenesis screens to find a version of Dronpa that doesn't become inactivated as quickly. Padron is a monomeric, reversible PA-FP derived from mutating Dronpa (T59M/V60A/N94I/P141L/G155S/V157G/M159Y/F190S) (7). Padron’s “positive” switching behavior is the opposite of Dronpa; when exposed to blue light, Padron is photoconverted from a dark state, to an activated state, emitting bright green fluorescence. When exposed to UV light Padron is inactivated. The rs-Cherries (8) are another group of reversible PA-FPs. These were engineered to be the first reversible, monomeric red fluorescent PA-FPs. rsCherries have a high background fluorescence, but their single molecule brightness and ability to switch from a dark state to a red fluorescent state make them useful for 2-color imaging with green PA-FPs. Similar to performing experiments with standard FPs, before choosing a PA-FP for your experiment, there are several parameters to consider, such as brightness, photostability, pH stability, chromophore maturation rate at 37 °C, turnover rate, and the level of background fluorescence. For any PA-FP application, the brighter the fluorescence the better. More fluorescence usually means more photons are being emitted, making it easier to capture a clear image above background. The majority of PA-FPs come in 2 flavours- monomeric and tetrameric. Tetrameric PA-FPS are better for whole cell imaging and studying organelle trafficking. Monomeric PA-FPs are usually preferred for studying single protein characteristics, as the monomeric state is less likely to interfere with endogenous protein structure and function. By generating monomeric PA-FPs, there is less chance that the chimeric protein will oligomerize, disrupting cellular function and localization, or leading to protein aggregation. Another important parameter to consider is the contrast ratio- a comparison of PA-FP brightness before and after photoactivation. A high contrast ratio usually indicates that a PA-FP has a low level of spontaneous fluorescence in the absence of photoactivation resulting in an increased signal to noise ratio. PA-FPs with higher contrast ratios may give you experimental results that are easier to interpret. The light intensity used to activate the PA-FP should also be considered. If the light intensity needed for activation is too high, the photoactivation step can actually harm your cells before your experiment even begins! If you are performing multicolor experiments, you will want to be sure that the light used to activate the first PA-FP does not photobleach the second, and vice versa. Finally, as every microscope will have it’s own quirks (level of zoom, intensity, possible excitation lasers) it is also important to optimize your activation protocol for your particular set up. Some of the most important applications for PA-FPs involve enhancing optical live imaging of proteins, organelles, and cells. Similar to FPs, PA-FPs allow for non-invasive labelling, but in contrast, PA-FPs offer a reduced potential for photobleaching and phototoxicity that standard FPs might induce though their continuous excitation. By generating PA-FPs fused to intracellular proteins, scientists can track single protein localization, turnover, and trafficking, as well as organelle trafficking and dynamics (fission, fusion, etc). For example, by engineering PA-GFP tagged to a mitochondrial matrix protein (mito-PAGFP) the Youle Lab was able to visualize and quantify the fusion dynamics of mitochondria in healthy and apoptotic cells (9). PA-FPs have helped to revolutionize the field of super resolution microscopy. PA-FPs, especially the monomeric, reversible type, are very well suited for super resolution imaging, where the power of the technique relies heavily on the same fluorophore being imaged multiple times in order to reconstruct an image. The best PA-FPs used for super-resolution imaging usually have the following characteristics-high contrast ratios, bright fluorescence, low spontaneous activation, and photoswitching between two fluorescence wavelengths. Indeed, within the world of super resolution microscopy, PA-FPs have helped create several new imaging methods, including photoactivation-localization microscopy (PALM, also FPALM) (11). For PALM, a small area containing inactive PA-FPs is photoactivated, imaged, and then photobleached. Additional PA-FP molecules are then activated in the same manner, until enough molecules have been analyzed to allow for construction of an image, providing detailed protein localization information in cells. A point to keep in mind- although PA-FPs are vastly improved over the conventional FPs for super-resolution imaging, they still do not emit the large number of photons achievable with photoswitchable dyes. Correlative light and electron microscopy (CLEM) is an imaging technique that combines electron microscopy (EM) with fluorescence localization data. However, this technique requires harsh fixation conditions to preserve cellular structures (0.5-1% osmium tetroxide). These conditions destroy most PA-FPs, but, in 2015, the Looger Lab designed 2 variants of EosFP that can withstand these conditions- mEos4a and mEos4b (12). Both variants are more monomeric than mEos2 (mEos4b is completely monomeric) and display bright and photostable green and red states. Beyond these imaging applications PA-FPs have been developed for use in yeast, as parts of biosenors, and much more. Do you have a favorite use for PA-FPs? Let us know in the comments section below! Currently, there are over 20 different varieties of PA-FPs available to the scientific community, and new variants are still being engineered. By combining PA-FPS with superresolution microscopy, scientists now have at their fingertips the tools to probe cellular dynamics and function with extraordinary molecular detail. 1. Patterson, George H., and Jennifer Lippincott-Schwartz. "A photoactivatable GFP for selective photolabeling of proteins and cells." Science 297.5588 (2002): 1873-1877. PubMed PMID: 12228718. 2. Subach, Fedor V., et al. "Photoactivatable mCherry for high-resolution two-color fluorescence microscopy." Nature methods 6.2 (2009): 153-159. PubMed PMID: 19169259. PubMed Central PMCID: PMC2901231. 3. Verkhusha, Vladislav V., and Alexander Sorkin. "Conversion of the monomeric red fluorescent protein into a photoactivatable probe." Chemistry & biology 12.3 (2005): 279-285. PubMed PMID: 15797211. 4. Wiedenmann, Jörg, et al. "EosFP, a fluorescent marker protein with UV-inducible green-to-red fluorescence conversion." Proceedings of the National Academy of Sciences of the United States of America 101.45 (2004): 15905-15910. PubMed PMID: 15505211. PubMed PMCID: PMC528746. 5. Gurskaya, Nadya G., et al. "Engineering of a monomeric green-to-red photoactivatable fluorescent protein induced by blue light." Nature biotechnology 24.4 (2006): 461-465. PubMed PMID: 16550175. 6. Ando, Ryoko, Hideaki Mizuno, and Atsushi Miyawaki. "Regulated fast nucleocytoplasmic shuttling observed by reversible protein highlighting." Science 306.5700 (2004): 1370-1373. PubMed PMID: 15550670. 7. Andresen, Martin, et al. "Photoswitchable fluorescent proteins enable monochromatic multilabel imaging and dual color fluorescence nanoscopy." Nature biotechnology 26.9 (2008): 1035-1040. PubMed PMID: 18724362. 8. Stiel, Andre C., et al. "Generation of monomeric reversibly switchable red fluorescent proteins for far-field fluorescence nanoscopy." Biophysical journal 95.6 (2008): 2989-2997. PubMed PMID: 18658221. PubMed Central PMCID: PMC2527278. 9. Karbowski, Mariusz, et al. "Quantitation of mitochondrial dynamics by photolabeling of individual organelles shows that mitochondrial fusion is blocked during the Bax activation phase of apoptosis." J Cell Biol 164.4 (2004): 493-499. PubMed PMID: 14769861. PubMed Central PMCID: PMC2172000. 10. Vorvis, Christina, Steven M. Markus, and Wei‐Lih Lee. "Photoactivatable GFP tagging cassettes for protein‐tracking studies in the budding yeast Saccharomyces cerevisiae." Yeast 25.9 (2008): 651-659. PubMed PMID: 18727145. PubMed Central PMCID: PMC4007248. 11. Hess, Samuel T., Thanu PK Girirajan, and Michael D. Mason. "Ultra-high resolution imaging by fluorescence photoactivation localization microscopy." Biophysical journal 91.11 (2006): 4258-4272. PubMed PMID: 16980368. PubMed Central PMCID: PMC1635685. 12. Paez-Segala, Maria G., et al. "Fixation-resistant photoactivatable fluorescent proteins for CLEM." Nature methods 12.3 (2015): 215-218. PubMed PMID: 25581799. PubMed Central PMCID: PMC4344411. 13. Berlin, Shai, et al. "Photoactivatable genetically encoded calcium indicators for targeted neuronal imaging." Nature methods 12.9 (2015): 852-858. PubMed PMID: 26167640. PubMed Central PMCID: PMC4597790. 14. Wang, Yingxiao, John Y-J. Shyy, and Shu Chien. "Fluorescence proteins, live-cell imaging, and mechanobiology: seeing is believing." Annu. Rev. Biomed. Eng. 10 (2008): 1-38. PubMed PMID: 18647110.